Today I am playing with Tritium WM, a tabbed/tiling window manager with features similar to Ion3, only, entirely written in python (as opposed to C and Lua, like Ion3). So far, it seems to work. It isn’t drawing java swing gui windows real well, sadly, and one of my main work apps uses java swing guis. Other than that, it is snappy. There really is NO documentation for this window manager…Nothing. I “spoke” with the author of this wm in #debian on freenode, and the only instructions he gave me were to look at the keys.py script for keybindings to figure out to navigate this wm, which, like ion3, is largely controlled from the keyboard. I may volunteer to write some documentation for this guy. I don’t know. There IS a man page, but it tells almost nothing. 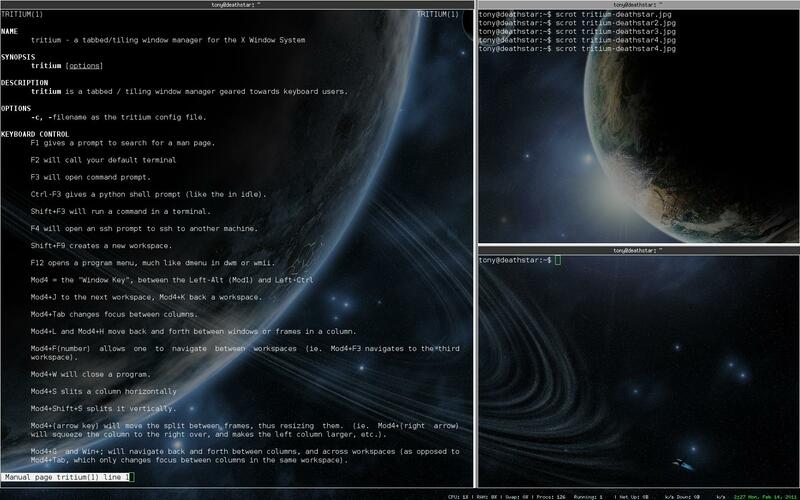 tritium is a tabbed / tiling window manager geared towards keyboard users. -c, -use filename as the tritium config file. F1 gives a prompt to search for a man page. F3 will open command prompt. Ctrl-F3 gives a python shell prompt (like the in idle). Shift+F3 will run a command in a terminal. F4 will open an ssh prompt to ssh to another machine. Shift+F9 creates a new workspace. F12 opens a program menu, much like dmenu in dwm or wmii. Mod4+J to the next workspace, Mod4+K back a workspace. Mod4+Tab changes focus between columns. Mod4+L and Mod4+H move back and forth between windows or frames in a column. Mod4+F(number) allows one to navigate between workspaces (ie. Mod4+F3 navigates to the third workspace). Mod4+W will close a program. Mod4+(arrow key) will move the split between frames, thus resizing them. (ie. Mod4+(right arrow) will squeeze the column to the right over, and makes the left column larger, etc.). Mod4+G and Win+; will navigate back and forth between columns, and across workspaces (as opposed to Mod4+Tab, which only changes focus between columns in the same workspace). Mod4-Shift+J moves a window to the frame below, Mod4-Shift+K moves a the frame above. Mod4+Shift+L moves the windows to the frame to the right. Mod4-Shift+H moves it to the left. I’ m probably missing something useful in there. I added this information to the man page on my machine, and sent the new file to Mike O’ Connor. Hopefully he’ll add that to the project’s file on sourceforge. The screenshot shows my updated man page. I’ll probably play with tritium some more. The reasons for which I was curious about it were, first, that I had heard/seen it compared to Ion3 (which I had used and loved for some time before the author thereof, Tuomo V., went off the deep end over the entire Free Software community not bending over backwards to cater to his whims), and, that it is entirely written in python, which I can make far more sense of than C (my fu is not strong, alas, in C, although I did make sense of the Lua in ion3, even if I could never claim to know the language). For both of those same reasons, I’ll probably spend more time with Tritium. UPDATE(2011.02.14): I keep playing with this wm. gdm did not want to recognize it automagically on my main box (the AMD64 box), so I had to make a tritium.desktop in the /etc/share/xsessions directory (copied one of the *.desktop files and edited it). On my old box, I had removed GDM. I only had to add it to the .xinitrc file I wrote in my /home on that box. I used gsetroot to add a wallpaper, and ran conky, much as I do in openbox, to show a clock and some system parameters (cpu/mem/swap, net up/net down / clock) in the bottom right corner. Looks cool, now. I finally acheived limited success with FVWM…sort of. I’ve got windows I can move around. But, hey, with free floating windows and a terminal, I can do anything. I HAVE succeeded in running TWM, and, I have a pager, and a menu, and I can “minimize” apps to little icons in the corner, and have even done some configuration, etc…Pretty groOvy. Here are a couple of lovely screenshots…click and have a lo0k! Not as cool as Fluxbox, still…but, pretty cool! To tell the truth, I didn’t like either of them. As far as I am concerned fluxbox still rules the roost. Afterstep wouldn’t be too bad, but customization is complicated, honestly, and, the thing I hated most was that you can’t get window focus by clicking on the window. You have to click on the window’s entry in the pager, or in a menu that comes up by clicking on the desktop. Editing the menus is an exercise in stupidity, too. With fluxbox, you edit a text file to alter your menu. Same thing for altering keybindings. Editing your keybindings and menus in fluxbox is like falling off a log. With Afterstep, you have to create a distinct text file for each entry. As far as MWM, well, I couldn’t get it to give me window decorations so I could move my windows, nor a menu. of one of the xterms. Additional apps would start in the same place, and the only way to switch to one that is not on top was to close the one on top. You couldn’t even resize some windows, so, if they overlapped the xterm in the middle, well…you couldn’t do anything until you closed that app. Now, MWM apparently works a lot like FVWM, because, that’s what I got out of FVWM, at first. I managed to make FVWM work, though. I couldn’t get MWM to work with me. I also wasted some time playing with IceWM. I don’t know why…I’ve tried it before, and never did like it. Although, it’s easier/more efficient for me to work in IceWM than afterstep, at least. So, Fluxbox is still my favorite. I also like JWM (Joe’s Window Manager). FVWM wasn’t so bad…maybe I should play with that again. I really have no use for bloated nonsense like KDE or Gnome anymore. I’ve tried Xfce, but, to me, it’s gnome…maybe a little quicker. Enlightenment is kind of pretty, but, it was difficult for me to get the hand of navigation and stuff, to where it really hindered my work flow. Besides, I’m not after eye-candy. I’m looking for functionality. Something easy to configure, efficient, useful. 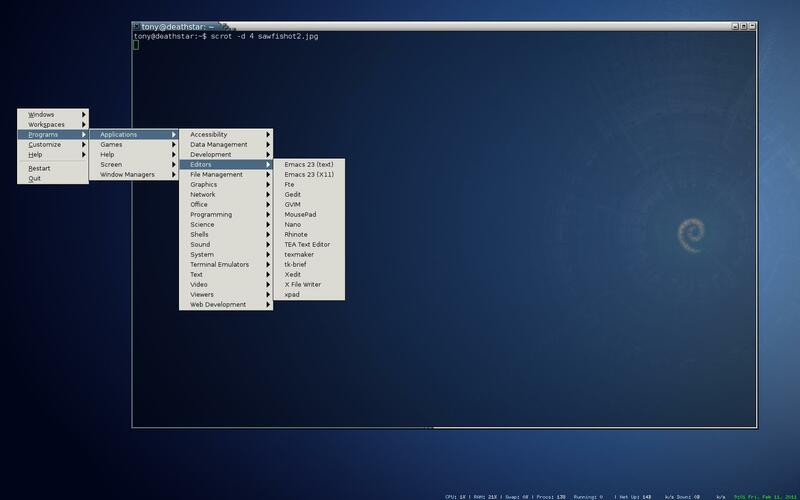 simplify, simplify, simplify: What makes a window manager user friendly? I used to think that what made a window manager/user interface easy to use was lots ot menus and buttons and icons and easy to find graphical elements…. One of the things that I really like about Fluxbox is how easy it is to program keyboard shortcuts. All I have to do is edit the keys file in my ~/.fluxbox dir. little terminal emulator, with three open tabs. Quite handy. I should program one in for OmegaT, and one for OpenOffice, too. those characters using alt-/, alt-1, alt-r and alt-c, but, for some reason, they don’t work in flux…). which is how I run almost anything else now… (like the “Run command” item on some wm menus). I do alt-c , and fbrun pops up and I can enter any program to run it. If I don’t know where the program is, of course, I can to alt-t, bring up sakura and do a whereis, then run it from there, or pop up fbrun, if I don’t to keep sakura up. Or, if I don’t rememeber what name I gave a script to run something, I can, likewise, open a terminal, cd to /usr/local/bin where I’ve placed all of my own scripts, and see what’s there. Who needs menus and icons and blinking lights? and a keys file….perhaps an init or start up file to start gkrellm, xcreensaver and a couple of other things. I could do anything I need just with a terminal and fbrun, which I could bring up with a key shortcut. I tried out FVWM, and, it’s more or less an empty desktop, pager, and a terminal, but, I don’t know how to program the keyboard shortcuts for it, yet, or configure the wallpaper. I’ll figure that out, though, when I have a minute, and, who knows?.